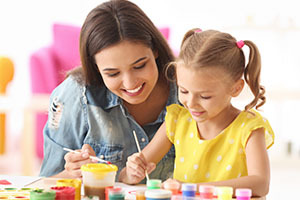 In Mommy & Me Art, you and your child will explore a variety of art materials, experience new textures, improve fine motor skills, and enjoy being creative in a group setting. Each lesson is planned to expose the children to an element of art, new art material, and basic art skills. Your child will get to try out printmaking, mixed media collage, watercolor painting, abstract painting, and much, much more! You will also get to collaborate with your child and make masterpieces you can cherish forever! Cost of class: $50 a month for members $75 for non members, with a one-time $25 supply fee! We provide the rest. Come dressed for a mess and adventures in Art! After submitting your registration form, please contact Kathleen Johnson at (615) 822-0789 with your payment information, or send a check to 1017 Antebellum Circle, Hendersonville, TN 37075. Reservation cannot be confirmed until payment is received. Tuition per month is $50 with a one time non renewable supply fee of $25. Seats fill up fast so sign up today! I understand that supervision will be provided during class hours. I release any person working in this program and agree to indemnify and hold harmless the City of Hendersonville, Monthaven Mansion, Monthaven Arts and Cultural Center, its staff, board members and all other persons involved with the program for any liability they have to me or my child for any injury received by my child while participating in this program. I agree to pay the tuition of $50/month at the beginning of each month that my child is enrolled, as well as a one time non-refundable supply fee due at the first day of class. Make-up classes are scheduled for all cancellations excluding the observance of federal holidays. With my signature, I have read and agree with all of the above.